It’s 7.30am in the morning and Dan, the Creative Director of the Potato Head Group is standing in an empty office, already rattling through the diverse responsibilities that his role entails while the rest of the island is still asleep, tranquil. Over the course of a day spent viewing the island through Dan’s eyes, it becomes apparent that this swift return to twelve hour-plus working days was inevitable given his restless work ethic and uncompromising creative energy. These qualities were forged far from Bali, from a time in his life that pre-dates even the roles that made and cemented his reputation: as a buyer at Oki-Ni he bent the rules of online fashion retail out of shape; as a co-founder of the influential LN-CC he tore them up completely. Born and bred in Newcastle, his childhood experiences still resonate even now, across oceans and time zones far removed from the industrial north-east of England where he grew up. “I didn’t like school really, I couldn’t wait to get out and do my own thing,” he says, his Geordie accent still disarmingly present despite his journeyed life. At the home of Cok Wah, the Prince Of Ubud. Outsiders are very rarely permitted access, but Cok Wah sees in Dan a kindred spirit trying who is also trying to preserve traditional Balinese culture, even if it is in a very different way. Beneath a shrine to the Hindu gods and against a backdrop of vibrant jungle, almost two million bricks were made in dusty workshops for the Katamama hotel - painstakingly made by hand in the traditional manner usually preserved for the construction of sacred temples. Dan’s ever-present involvement in music—from throwing his infamous Bad Passion parties in London with childhood friends to the intensely intimate improv performances he still arranges to this day—are characterized by a desire to create personal connections and relationships. You get the sense that the increasing scope of his work and ambitions is a way of simply growing the extended family of colleagues and collaborators he has been nurturing throughout his life. His record label, Island Of The Gods, is a case in point: for its critically revered first release, Hipnotik Tradisi, Dan brought London friend and electronic producer George Thompson (aka Black Merlin) to Bali, to record with some of the local musicians that had so entranced Dan during his time there. The painting on the cover is of an Ubudian gamelan master who passed away recently, shortly after Dan came to know him. “But you know what, he was a grandfather as well,” says Dan, shedding some light on the things he finds most rewarding in his work. “And all his grandkids, they’ve added me on Facebook and keep messaging me because they can’t believe a record with their granddad’s picture on the front is appearing in ‘Best Of The Year’ lists alongside people like Kanye West.” It seems almost too neat to add that the full name of the company that wrenched him back from paradise – that he just couldn’t say no to—is Potato Head Family. Almost every rug, gown and piece of upholstery in Katamama begins life here, hand-woven and hand-dyed with the natural pigments of the local plant life. Potato Head have quickly carved out a reputation as creatively fearless pioneers in an industry so often defined by outdated and superficial notions of luxury. At the heart of that ambition stands Dan, whose deep love for Balinese culture intertwines with that uncompromising creative approach that has been ever-present in his career. For Dan, the switch from fashion to hospitality was relatively straightforward and he leans on past experience to instinctively guide the next phase of Potato Head’s evolution. Head towards the original Potato Head bar in Seminyak, Bali and it becomes impossible to miss the first large-scale contribution Dan has made: the recently opened Katamama hotel bursts out of the surrounding palm trees and into the sky. 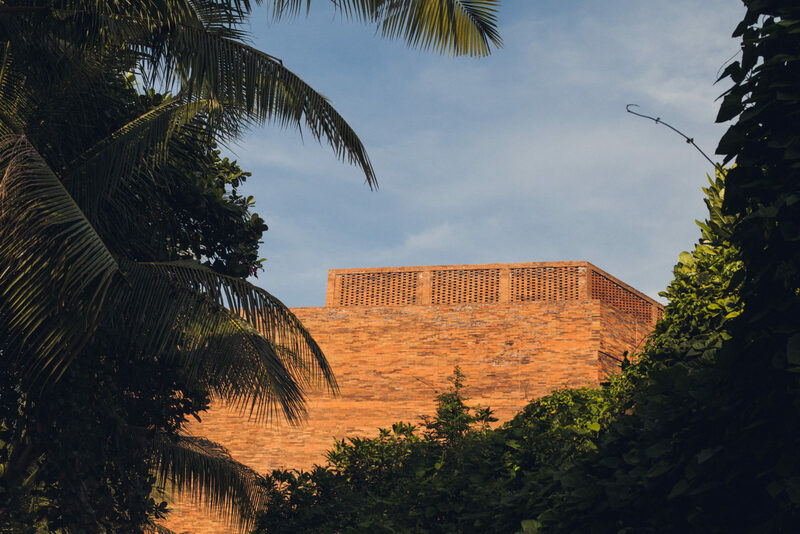 Designed by the acclaimed Indonesian architect Andra Matin, its exterior fuses an almost brutalist aesthetic to the spiritual earthiness of the land its sprung from: it is built entirely from locally-made, hand-crafted bricks. After his early morning stint in the office, Dan (by way of a brief surfing sojourn) heads inland to check in with the artisans responsible for sculpting those very bricks. The relentless, static traffic of tourist-heavy Seminyak gives way to winding roads dotted with villages. Mopeds overtake the car, which moves slowly enough to take in the picturesque rice fields along the way. “Each of the villages around here specializes in a different craft,” says Dan. “So we’re heading into one where everybody makes bricks. If you want ceramics or wood-carving, then you have to head to a completely different village altogether, where everyone there will be doing that one thing.” At almost exactly the moment Dan is explaining this, the view morphs into exactly what he’s describing: ramshackle kilns and workshops line the streets, punctuated by stacks of precariously placed bricks and dried out coconut shells used to fuel the kilns. It’s only once arriving at the particular suppliers for Katamama however that you truly get a sense of Dan and Potato Head’s commitment to the local craft. In place of an industrial-sized operation stand two men at their own individual machines, working silently—almost meditatively—with their hands and scalpel to shape rectangular blocks of deep red clay into bricks. You can’t help but ask, how long did it take to make the bricks for Katamama? The answer is stupefying, not least for its matter-of-fact delivery: four years to make 1.8 million bricks. At first, it’s almost jarring to see Dan standing against such a backdrop. His wild hair and beard can’t hide his still-boyish looks and skin still predisposed to sunburn. The tinted sunglasses, boldly patterned shirt from a cult Japanese brand and swimming pool-colored trousers conjure someone from the cover of one of his beloved cosmic disco records, circa Italy in the late seventies. Yet it’s impossible to see cynicism in the way he has immersed himself in the culture here. He interacts warmly and reverentially with the clay-covered workers—and later in the day with the indigo dyers responsible for the beautiful textiles that adorn the interiors of Katamama. Their understanding of what Dan is trying to achieve seems to transcend his faltering Indonesian-with-a-Geordie-accent. Just in case it doesn’t, Dan also makes sure they get to experience first hand the fruits of their labor. Workshops with local indigo-dyers and ceramicists are arranged not just as a recreational activity for guests but as a way of encouraging the artisans to persevere with their traditional craft in the face of the rampant commercialization their island is battling. “It’s tough,” says Dan. “There’s a whole generation who you hope will carry on these traditions, rather than just being enticed by a job in a new phone shop or whatever.” What’s never in doubt is just how intrinsic the local craft is to the luxury experience that Katamama provides. Every last detail, from the handwoven rugs to the hand-molded soap dishes is impossible to separate from the people who have worked on them. Dan breaks off to check his phone—it’s been a long day under the hot sun but he never strays far from the whatsapp groups that allow him to remotely keep a handle on things in an environment ill-suited to the formalism of desktop email clients. Dan seems to be doing something right. He receives another notification that Hypnotik Tradisi has made another Best Of 2016 list (the second time that day) and a message from a London department store saying they’re extremely interested in stocking Zephyr Blues, the childrenswear brand that his Indonesian wife Hilda founded shortly after the birth of their second child. Dan’s attention soon diverts again to his immediate surroundings though, as local florists begin repopulating the restaurant’s greenery and the waiting staff huddle for a team meeting. Dan offers one final summation of the simple philosophy behind the multitude of projects he presides over. As ever, his matter-of-fact tone belies the inspiring mindset that brings his work to fruition against all odds. “It all comes back down to family values. Love one another. Respect and appreciate everyone you work with.” It’s as good a credo for living the ‘island life’ as you could hope for—wherever you are in the world. As one of Bali’s iconic sunsets begins to take hold we thank Dan for a tour around the island that will stay long in the memory. Find out more about Potato Head here and Katamama here. Island Of The Gods is the name of Dan’s record label and Zephyr Blues is the ridiculously cool childrenswear brand that he helps his wife Hilda with in any spare moments he manages to find.